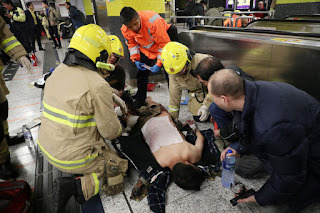 During dinner tonight, around 7.20pm, my friend received a whatsapp message from her friend that there was an incident at the Tsim Sha Tsui MTR station and to avoid taking the MTR. 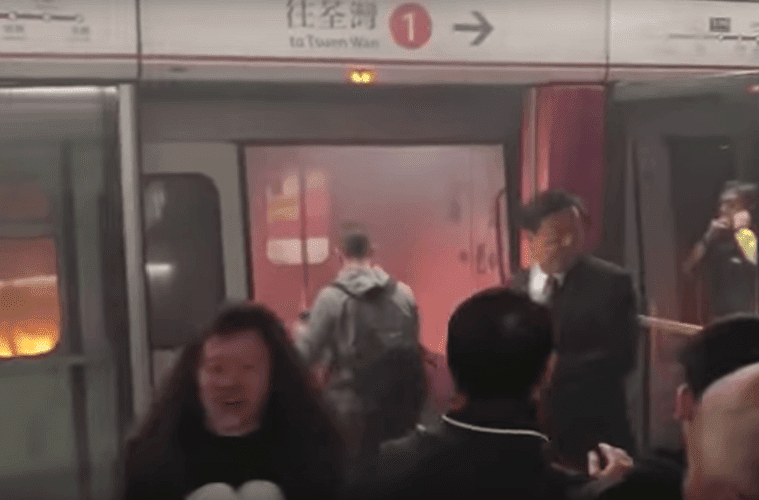 We then went on some news websites and soon discovered there was a fire in one of the train carriages going from Admiralty to Tsim Sha Tsui during rush hour. 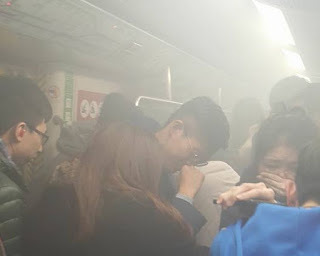 Then shocking photos and videos emerged very quickly on social media -- there was a fire in the train carriage, and a man lying on the ground, his trousers were all burned to his thighs, exposing severe burns on his legs. Another showed him standing upright with his pant legs on fire. Others showed passengers cupping their mouths in a very smoky carriage. At first it was four injured, then six and now 17. The police have arrested a 60-year-old man, who they say, told passengers, "Burn you to death", then lit a Molotov cocktail and threw it in the packed train carriage before it reached Tsim Sha Tsui MTR station. The man, Cheung Kam-fai, claimed to start the fire for "personal reasons", and police say initial investigations have found he has a poor relationship with his family, and he had previously been arrested for minor offenses, such as gambling. Yau Tsim District Commander Kwok Pak-chung dismissed suspicions it was a terrorist attack, saying so far there was no such evidence, but said they would not rule out any possibilities in their investigations.